Puliyogare is a South Indian rice preparation mixed with tamarind pulp and spices. It is offered to Perumal and served as prasadam in temples. 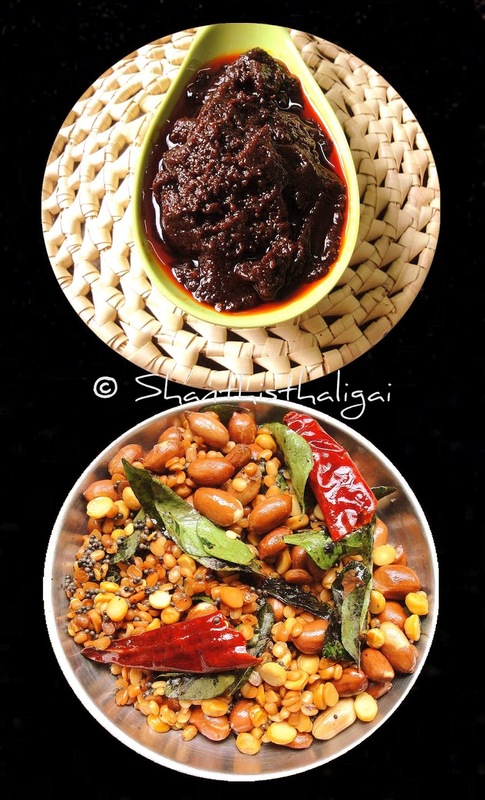 Puli in Tamil is tamarind , Ogare is rice and Gojju is the paste made to mix with rice. Hence it is puliogare gojju. Puliyogare is also termed as Hulianna in some parts of Karnataka, puliyodharai in Tamil Nadu and Pulihora in Andhrapradesh. Any Iyengar family would have these pulikkachal(🔗)/ gojju stocked and the recipe is passed down through generations. This Puliyogare gojju / Mysore Iyengar puliyogare gojju will be slightly sweetish unlike the spicy pulikkaachal of TamilNadu(🔗) and slightly different in the way it is prepared. In Karnataka, they add more jaggery, but I reduced the jaggery as I always prefer spicy paste. Make the rasam powder with byadge chillies for a bright colour. In Karnataka, jaggery achu / blocks are used. More jaggery can be added if you like the sweet taste. There are many variations in rasam powder which will definitely change the taste of the puliogare. If you do not have karnataka style home made rasam powder, MTR rasam powder can also be used. I will post the rasam powder used for this later. Ensure low heat to avoid burning. Oil should always float on top. Temper only while mixing the rice and paste, which gives the crunchy bites and fresh taste. Dry roast sesame seeds until it splutters, transfer it to a plate. When cool grind it to powder. Keep aside. Heat half the oil, add the pulp. Allow it to boil. When it boils add, rasam powder,hing and jaggery. Reduce the heat to medium and stir occasionally. Be careful not to burn the paste. When slightly thick, add salt, reduce the flame to low and add sesame powder. Add the remaining oil. Stir well. Let it boil for few more minutes. Traditional puliyogare gojju is ready. When cool, store it preferably in glass bottles or glass containers. When kept at room temperature the gojju stays good for a month (only if the above mentioned oil is added). This paste can be stored in fridge for atleast 6 months. In a tablespoon of oil, fry the items given in “tempering” to golden brown. Add little of the paste and temperings to the cooked rice. Mix well without breaking the grains. Mysore Iyengar Puliyogare is ready.